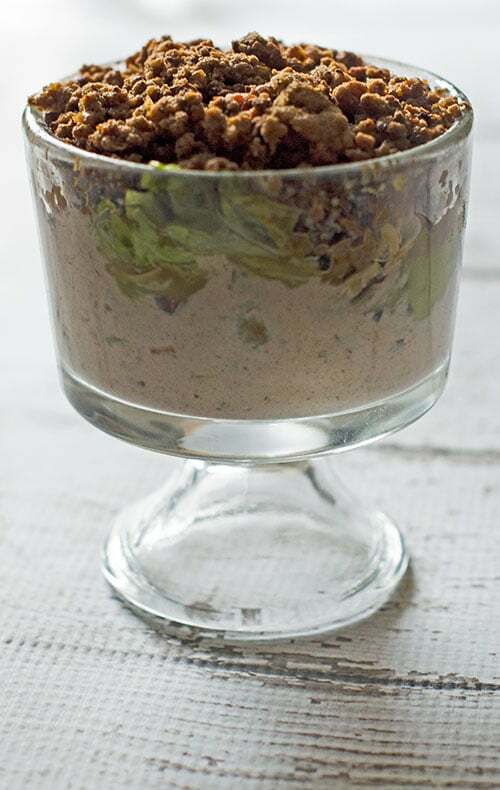 I received a complimentary set of Martinez Salsa to help make this Beefy 7 Layer Dip recipe. I’m normally not a dipper as far as dressings and sauces go, but I love love love chips and veggies with dip. There are so many varieties jam-packed full of flavor whether it’s savory or sweet. Dips are something just about everyone loves, so they are great for parties, but I must admit I love them so much that sometimes we’ll have an appetizer dinner night. As you guys probably know by now, I love appetizers so much overall that I can’t wait for the Super Bowl even though I’m not a huge football fan. Besides, it doesn’t get much better than having some delicious food while watching hilarious commercials and football with friends. I added football stitches in sour cream to the top of our dip to make it a bit more Super Bowl festive, but a drizzle of warm queso is also super yummy. So, when Martinez Salsa (make sure you read the whole post so you can enter to win some salsa and a $25 gift card for yourself!) asked me to come up with a Super Bowl appetizer recipe, I knew I had to make a 7 layer dip recipe. 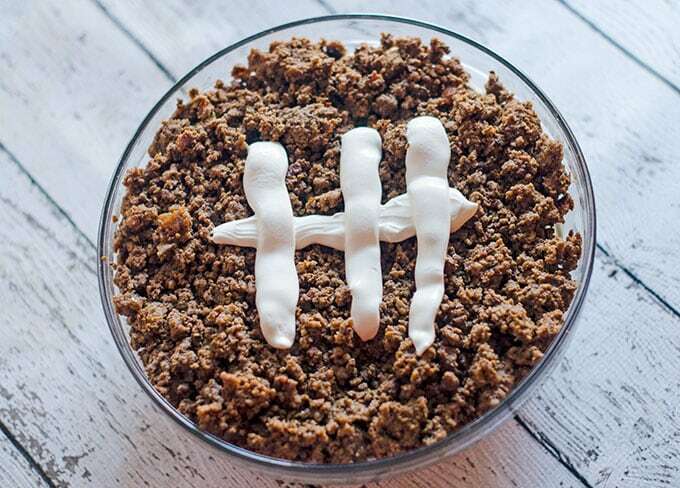 7 layer dips are usually made with refried beans, which I love, but unfortunately Mr. Savvy has a tree nut allergy, which means he sometimes even reacts to beans. So, as an alternative, I thought why not use ground beef instead? There’s a ton of different layers you can use, but we like taco seasoned ground beef, peppers (I prefer red, but the store only had green this week), red onion, lettuce, cheese, olives (I usually leave them out since Mr. Savvy unfortunately doesn’t like them), guacamole and sour cream mixed with salsa (adding a bit more taco seasoning here is also great. Someone sick? Make up individual servings to spread less germs or make a bar of layer ingredients for picky eaters. The resulting beefy 7 layer dip is kind of like a layered taco and oh so yummy. I absolutely love all the different flavors and textures melded into one big tasty bite on top of a crunchy corn tortilla chip. 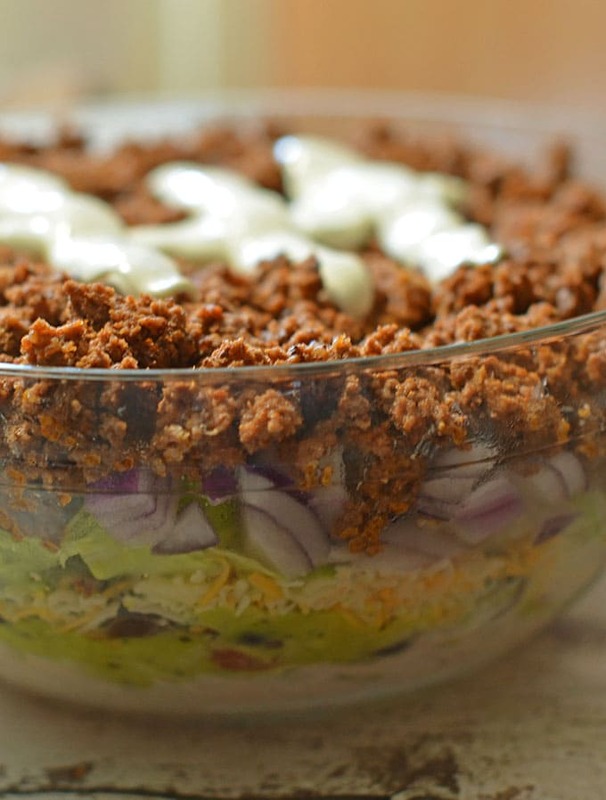 If you somehow happen to have leftovers, it also makes for a great taco salad. Since the Super Bowl is around the sickies time of year, you can also easily make this recipe into individual servings to help spread less germs around. I used mini trifle dishes, but you could of course also use small plastic cups for easy clean up. I also love the idea of having a bar of all sorts of dip ingredients and let your guests make up their own 7 layer (or more) dips in small cups. 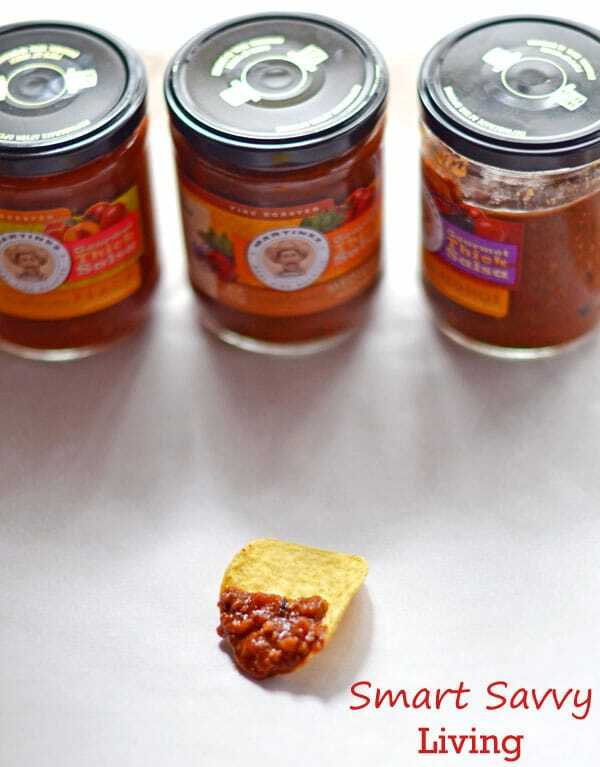 I love Martinez Salsa’s thick salsa full of texture and flavor. The Martinez Salsa is great to use as a layer, but I mixed it with the sour cream since sour cream can be a bit lacking in flavor but is certainly kicked up a notch and is given a bit of texture with Martinez Red Hot Salsa, our favorite flavor. 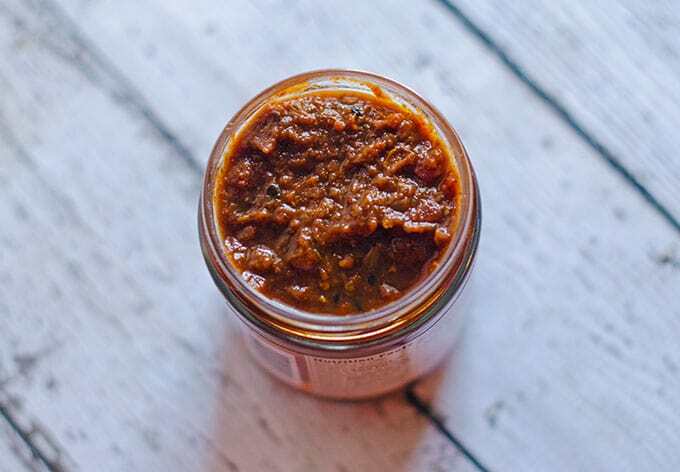 Martinez salsa has a bit of texture to it and a lot of flavor – you can actually taste the spices! I also added about a cup to the ground beef layer after it was cooked. It helps give the beef a bit more appetizing color than just drab grayish brown, while adding more flavor and moisture. Martinez salsa is great to use in a variety of dishes, such as another great Super Bowl appetizer that we made last year, loaded chicken nachos. Here’s how I made our 7 layer dip recipe, but it’s totally customizable to what flavors you and your family like. P.S. While I put football stitchings in sour cream on the top to make it a bit more Super Bowl festive, it’s also super super extra tasty with a nice drizzle of warm queso right over the top. 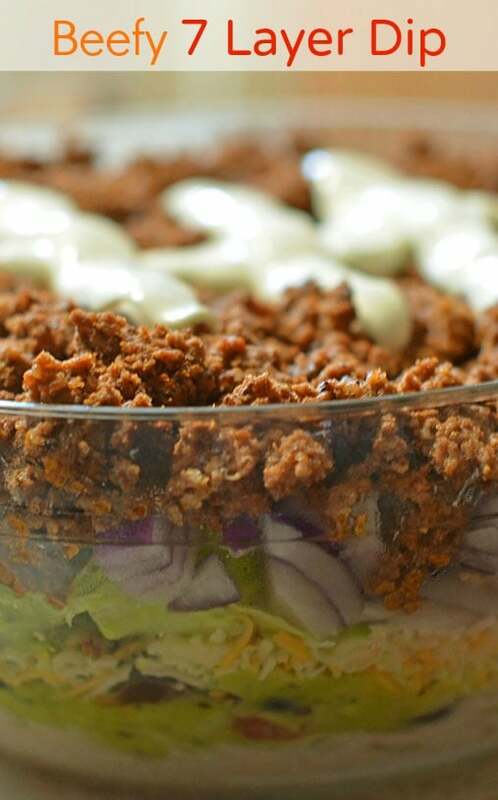 This Beefy 7 Layer Dip recipe is a great Super Bowl appetizer and party appetizer. Exact measurements will depend on how much dip you want to make and the serving dish you use. Using a slotted spoon, remove beef from pan into clean bowl. It's important to take the time to really let the fat drain from the beef so your dip isn't greasy. Using a large spatula or masher, break down any large pieces of ground beef so that it is all bite size and easy to pick up with a chip. Season beef to taste with taco seasoning and salsa. You can layer in whatever order you'd like, but here's how I did it. I put all the wet ingredients at the bottom so they wouldn't make the other ingredients wet or heavy (think overly dressed salad). Mix sour cream (I used about 1.5 cups) with salsa (I used about 1/2 cup) and pour into the bottom of your serving dish, spreading to even. You can also add taco seasoning to the salsa for more flavor. Spread a layer of guacamole over the top. Sprinkle a layer of thoroughly drained sliced black olives over the guacamole. Sprinkle a layer of shredded cheese over the olives. Add a layer of shredded lettuce. Top lettuce with chopped onion. Place slightly warm beef on top of onion evenly. Serve as is, or decorated with sour cream, or with a drizzle of warm queso. Best served immediately as the ingredients will start breaking down and guacamole will brown after several hours. 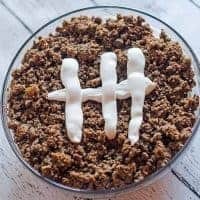 This recipe is very versatile so you can add or remove any flavors your family likes or dislikes. Would you like to win 4 jars of Martinez Salsa and a $25 Amex gift card? You’re in luck as one lucky Smart Savvy Living reader is going to win just that! Giveaway is open to those that are 18+ and residents of the 50 United States + DC. All entries must be completed on the Rafflecopter below; please see the widget for full terms. Giveaway ends 2/10/14. Martinez Salsa is sponsored the giveaway and is responsible for all prizes and shipments. My favorite appetizer is the cheese ball! I love jalapeno roll ups – thank you. I like pizza rolls and chips & dip. Mozzarella sticks are my favorite. Leave a comment on this post telling me what your favorite Super Bowl appetizer is. I think my favorite appetizer for the super bowl is spinach dip in a bread bowl. Yum. I like french onion dip and potato chips; can sit forever eating that. I always make Chex Mix!